What Does Synesthesia Feel Like? If you look closely, do you notice anything unusual in this picture? Look up high, on the left, near the mast . . . yes, that’s a fish that was swimming so close to the surface of the water that it became a part of my picture which is why I named it Fish in the Sky. 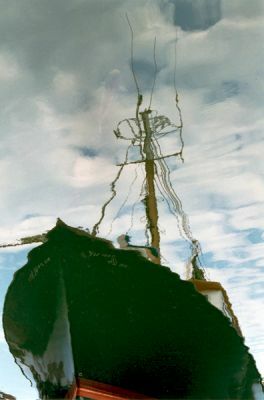 This image offers a good way to show you what synesthesia feels like because to appreciate both the reflection and the fish, your focus must be in two places at the same time which is not possible. Yet how can you say the reflection is any less real than the fish? That which is perceived in peripheral vision is no less real than that which is the focus of the eye. My synesthesia similarly operates in peripheral vision.